Crispy and perfectly delicious churros with traditional cinnamon sugar and Spanish hot chocolate sauce. 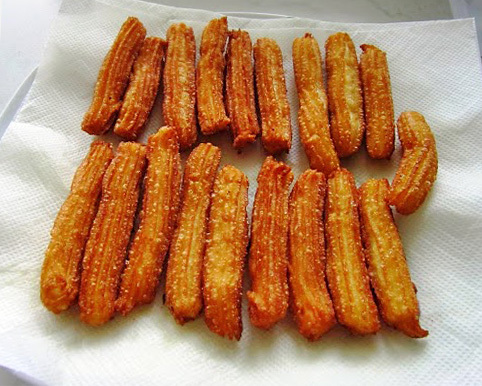 Learn how to bake homemade churros. Place water, butter, 3 tablespoons sugar and salt in a medium saucepan. Bring to a boil over medium heat. Then remove from heat and add flour. Beat with a wooden spoon until dough forms a ball and releases from side of pan. Vigorously beat in eggs, one at a time and beat after each addition until mixture is smooth. Spoon dough into a pastry bag or a cookie maker with a star tip. Pipe out 3”x1” strips onto waxed paper-lined baking sheet. Freeze for 25 to 30 minutes. Pour oil into a 10” skillet to about ¾” thickness. Heat oil to 375 degrees F. Transfer dough strips into hot oil with a large spatula. 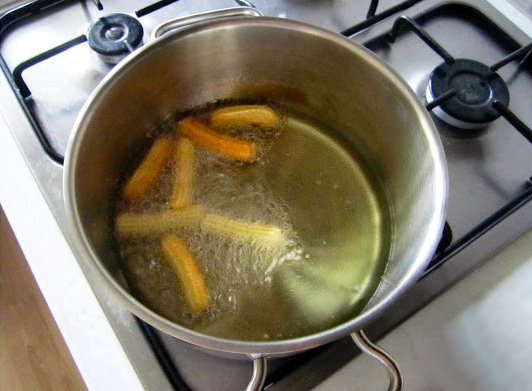 Fry 5 to 6 churros at a time until deep golden brown, about 3 minutes, turning once. 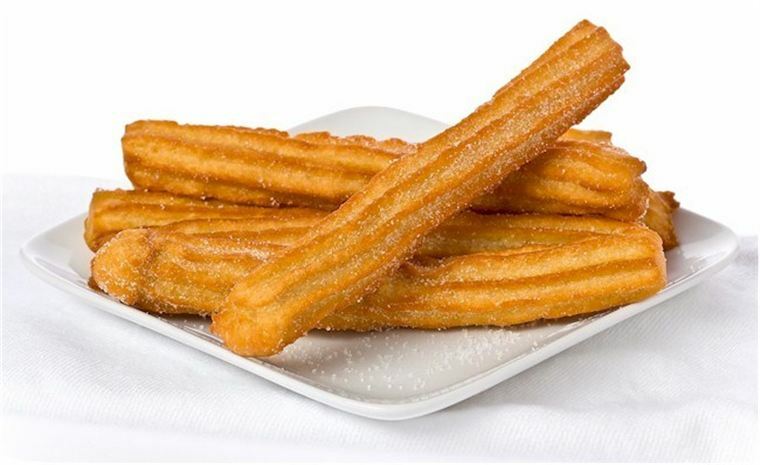 Remove churros with a slotted metal spoon to a paper towel-lined plate. Combine remaining 5 tablespoons sugar with the cinnamon. Place in a paper bag. Add warm churros a couple at a time and gently shake to coat. Place on a serving platter, and repeat for all churros. Serve with Spanish hot chocolate. This makes a delicious breakfast, dessert or midday snack. Enjoy!